Yes, I know it’s hot as a firecracker outside. But, you can feel the tide turning. Even though we are in the midst of a heat wave, we’re starting to think more and more about the cool weather sport known as….FOOTBALL! Here at Triple J’s that makes us very happy. We have a tradition of catering some of the Texans games in the past as well as throwin’ some awesome college football parties right here on our patio. So you can imagine that we’re getting pretty anxious to start flippin’ the burgers, choppin’ the beef, smokin’ the sausage, and bastin’ the ribs to serve to our awesome football fans when the season gets underway…and it’s not that far off. When preseason games start in the next few weeks don’t forget to stop by Triple J’s before or after the game (or both) for some lip-smackin’ barbecue and a glass of your favorite brew or frozen daquiri. We’ll be happy to box-up your favorite bbq treat to take with you to the stadium, the watch party, or back home so you can enjoy our famous slow-smoked goodness while watching the game! When it comes to the Texans we’ve got a lot to be excited about: the addition of some high-caliber new players and the return of some pro bowl regulars. It should shape up to be a really exciting season with a lot of pride to go around. The best way we feel you can celebrate is to load up on your favorite Triple J’s meat plates or baked potato meals and a nice cold glass of sweet tea, lemonade, or a frozen rita; then sit back and watch as our favorite home town team puts a whippin’ on the rest of the NFL. Here we are once again celebrating our independence in the greatest country in the world! Many of you are taking vacations all or part of this holiday week and we wish you great fun and a safe time. As you prepare to celebrate we urge you to give thanks for the great nation we live in and remember to pay tribute to those who have gone before us, including the 19 firefighters who perished this week in the Arizona Wild fires. Our usual holiday celebrations include fireworks, a relaxing time away from work, and an abundance of great food and drink! Every year at this time you can just feel the excitement in the air as millions of us take to the highways, the beach, the backyard pool, or the comfort of the living room where we can just “veg” out. In any case we all look forward to “chowing down” on our favorite dips, chips, party foods, and the great Southern tradition – BBQ! Whatever your plans, be sure to include the mouth-watering, slow-smoked goodness of Triple J’s Smokehouse BBQ. Grab a 2-Meat platter, a rib sandwich, a sliced beef sandwich, a Raven Bowl, a baked potato stuffed with meat & cheese, or a couple of links of boudain with white bread. If you come by in the afteroon after 4pm enjoy one of our frozen ritas or daquiris at happy hour prices, too! Check us out on Facebook and give us a like, would ya? Happy July 4th! If you travel the freeways and back roads in and around Houston you’ll discover a variety of barbecue restaurants. Typically, they all serve the usual: beef brisket, pork ribs, chicken, etc. So what makes one different from the other? Some would argue it’s the location – one is situated in a better part of town where there’s a larger number of office workers, residents, and visitors who love barbecue so they get more traffic. Maybe that’s a legitimate argument, but one that doesn’t sound very convincing. Others would say one barbecue restaurant has a better menu than the next, therefore variety makes it better. Still others would want you to believe that their favorite barbecue place has the freshest beef, ribs, and chicken in town and the way the food is prepared makes it the top choice. Truth is, every barbecue joint in town has it’s strong points. But, some have more than others! Take, for instance Triple J’s Smokehouse. We specialize in always serving a variety of your favorites – ribs, chicken, beef, homemade links, boudain, and more. Signature dishes include The Raven Bowl: hot french fries, covered with grated cheddar cheese, topped with chopped brisket, and smothered in tangy bbq sauce! Another crowd favorite at our restaurant is the baked potato stuffed with chopped beef, chicken, or sausage, and all the fixin’s. On top of the standard bbq favorites we offer buttercream cake, Italian sour cream cake, peach cobbler and other treats. Don’t forget Happy Hour each day with Frozen Daquiris and Margaritas! We’re located just a few blocks off the 610 Freeway on Homestead road, minutes from Kashmere High School and adjacent to major businesses in the area. Our seasoned barbecue pit holds dozens of ribs, briskets, chicken, sausage and boudain – all at the same time, using Texas post oak wood for flavorful smoke. What’s the point of bringing this to your attention? Well, in a nutshell it’s to share the fact that Triple J’s has the variety of meats you’re looking for, the taste you’re craving, and the location that’s easy to get to! So come on…put some of the South into your mouth! We can’t wait to serve you! I think it’s safe to say the no roasted cut of meat can match the taste, the texture, and the allure of BRISKET! Chopped, sliced, shredded – on white bread, on a potato, by itself – smothered in barbecue sauce, topped with cole slaw, covered with mayonaisse – it’s all goooooooood! Brisket is enjoyed all year ’round, but really savored in summer. When paired with beans, coleslaw, potatoes, dirty rice, and many other side dishes, it’s hard to find a better meal! Brisket is a family and friends meal – a meat you can enjoy at a backyard barbecue, a church gathering, a wedding reception, a class reunion, a banquet, or…in your own kitchen! So all summer long let’s celebrate the meat that offers us so much without asking for anything in return; the meat that is easy to pronounce and fun to eat; the meat of the rich and the poor – BRISKET! 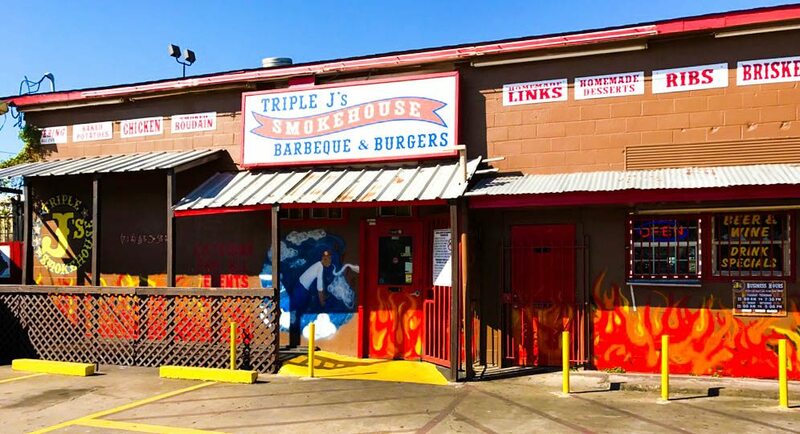 Come to where you get some of the best brisket in Houston…TRIPLE J’S SMOKEHOUSE. Let’s all remember and honor Memorial Day on May 27 this year. It’s a Federal Holiday that occurs on the final Monday of May each year and is the unofficial start of the Summer. Most important, it’s the day we remember the men and women who perished while serving us in the Armed Forces. This day originally commemorated the Union and Confederate soldiers who died in the Civil War but now is considered the highest tribute to all Americans who have fought and died in all wars. Take time to pay tribute to friends, acquaintances, relatives, and those unknown to you by posting your American flag or making a trip to the Veterans Memorial Cemetary on that day. If neither of those is possible simply remember them in your thoughts and prayers. Since Memorial day is considered the start of summer you know what that means…barbecue and more barbecue! As one of the city’s best barbecue joints Triple J’s Smokehouse should be part of your regular dietary routine! This summer we will be featuring all of the most loved meats and side dishes that have made our restaurant one of the most talked about around town and in social media. But you already knew that didn’t you? Come early and come often for our Raven Bowls, our tasty ribs, brisket, chicken, and homemade sausage. Don’t forget to pile on a couple of links of Louisiana Boudain, either! Our juicy chicken is just as popular as it ever was! So, with the summer season upon us make sure you get as much Triple J’s barbecue, sweet tea, and frozen lemonade as you can handle; because we’re makin’ it all fresh for you each day! Our Ribs and Brisket are the BEST…but what about our boudin? 8It may not be much of a surprise to you to learn that ribs and brisket are two of the BIG sellers at Triple J’s. Both meats are slooooowwwww smoked over Texas post oak wood for many hours, after being rubbed with our special blend of spices and herbs. The smoke-infused meat takes on a special flavor that has made our barbecue famous all over Houston! The brisket, ribs, and links are alone worth the trip, but the smoked boudin at Triple J’s Smokehouse is not to be missed. It’s a great example of the amalgamation of the pork-focused Southern barbecue tradition of East Texas with the Cajun/Creole flavors of Louisiana. The smoking process turns the natural sausage casing crispy and golden brown, and the pork and rice interior absorbs a wonderfully smoky essence. Squeeze some of the filling onto a cracker, top it with a dash of Tabasco, and enjoy one of the quintessential flavors of Houston barbecue. It may not be much of a surprise to you to learn that ribs and brisket are two of the BIG sellers at Triple J’s. Both meats are slooooowwwww smoked over Texas post oak wood for many hours, after being rubbed with our special blend of spices and herbs. The smoke-infused meat takes on a special flavor that has made our barbecue famous all over Houston! Are you chained to the office??? If your work schedule keeps you tied to your desk at the office, it’s no wonder. Even in today’s computer world (where things are supposed to be easier and quicker) we still have a lot of data entry, email correspondence, and LinkedIn contacts to keep up with. Also, your supervisor may be staring over your shoulder to make sure the assigned task is finished on time. The pressures of the work week are not really any better than they used to be…in fact, they may be worse. You need to make time for yourself! Once work is complete, and you’ve satisfied your obligation at the office, you deserve to pamper yourself. You say…well, that never happens; what I do is an ongoing process. Well, one thing is for sure: each work day comes with a lunch break. It’s a time where you like to “get away” and enjoy the views outdoors, grab a good meal at a nearby restaurant, and spend quiet time with your own thoughts and the reward of good food. This is where Triple J’s comes in! You can be assured that if you head out of the office to get a quick bite to eat, we’ll be there and ready to serve you the kind of meal you want to enjoy in that brief time where you don’t worry about anyone but yourself. If your lunch break doesn’t allow you the time to sit and dine at our place you know you can get a sandwich and fries, a loaded baked potato, or a complete meal with your favorite barbecue meat, to go. Take it back to your work desk or your company kitchen and dig in. It’s a nice break from the boring old work routine you might be stuck with everyday. The only thing that co-workers may wonder about…is that big smile on your face once you return from lunch hour! Barbecue: Where did it come from? Growing up in the South most of us ate our share of barbecue so it’s a regular part of our diet. Did you ever wonder where this method of cooking meat came from? Well, I did so I researched it. One theory suggests that when the first Spanish explorers arrived in the new world they noticed that the natives often preserved their meat in the sun; only problem was that the meat easily spoiled and became infested with bugs. So the natives built small fires to create smoke that would keep the bugs away and while doing so put meat on racks over the fire. There are other theories of how the process of “barbecuing” began but today good pit masters use the method described above to render a good crust on the exterior of the meat, and great flavor and tenderness on the inside. Triple J’s Smokehouse pit masters follow the tradition of preparing our ribs, chicken, brisket, and pork with a flavorful spice rub then placing each piece on racks which rotate continuously over a hot fire – fueled by post oak wood gathered here in Texas. The process takes hours and hours but the results are amazing. Traditionally, Southerners favor pork because in the beginning colonies found that pigs were plentiful and easy to raise. But in Texas cattle have been raised by ranchers for generations and the briskets that come from those cattle have become the favorite Texas barbecue meat. Whatever you prefer – pork ribs, sausage, brisket, chicken, or even burgers – we’ve got you covered! Triple J’s is your first choice for dine-in or take-out every weekday, for lunch or dinner! Come see us for what many call…”the best barbecue in Houston”! Wow it’s already Spring, and mother nature is providing us with seasonal changes that make it more desirable to be outdoors. With that in mind, Triple J’s is providing the ingredients for one of our favorite past times – enjoying a good barbecue meal outside. We’ve seen more and more of our customers order their favorite barbecue meal in our restaurant, then head out to the deck to relax, enjoy the cool breezes and chow down on awesome Texas barbecue! After all, when you feel the pressures of the work place – being stuck inside all morning or having to meet mounting deadlines, can you think of a better place to be for that precious little time you have to enjoy your meal?? We think we offer the best combination of food, atmosphere, and relaxation that you can find anywhere in the area! So, come lunch time or dinner time bring yourself and your appetite to 6715 Homestead and get in line. We’ll have hot smoked brisket, sausage, boudain, pork ribs, chicken, and stuffed baked potatoes waitin’ for ya! The only stress you’ll experience is deciding which meat platter or sandwich you’re going to have today! See ya soon.